The last few weeks, I have had the great fortune of spending some time in Cataluna enjoying brilliant yellow sunflower fields and the still brisk salty Mediterranean water. In short, I had absolutely no complaints. However, being that I was traipsing around the area drinking several bottles from DO Penedès, I wanted to do a bit of research as to the region itself. Physically, DO Penedès is located just southwest of Barcelona between the coastal hills and the narrow plains of the Mediterranean coast, directly in the center of a deep valley, and is divided into three separate areas: the Lower Penedès (baix- Penedès in Catalan), the Central Penedès (mitja- Penedès) and the Upper Penedès (alta Penedès). The Low Penedès primarily grows Garnacha, Carinena and Monastrell as their red varieties, while the white varieties include the three famous Cava varieties: Macabeo, Parellada and Xarel-lo. Due to the brisk temperatures in the Central Penedès, Cava grape varietals also thrive here along with Cabernet Sauvignon, Merlot and Tempranillo. Finally, the Upper Penedès is famous for their more delicate grapes, such as: Chardonnay, Pinot Noir, Cabernet France, Riesling and Gewurztraminer. As a result of DO Penedès incredibly diverse microclimate, it is of no surprise that wineries like Miguel Torres, who the largest plantation of Catalan grapes in the entire region, has had such wild success. 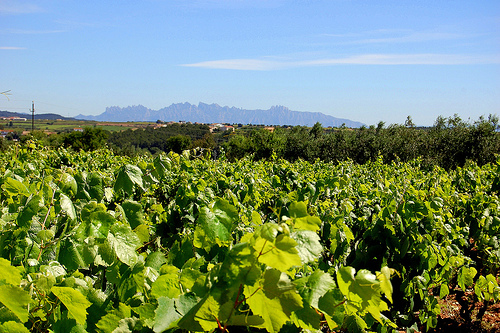 DO Penedès is not only famous for increasing the quality and reputation of their sparkling wines, but also for their largest quantity of native grapes worldwide – approximately 121 different varietals. Eighty percent of the vineyards produce the three famous Cava grapes along with Chardonnay; however, other white varieties include: Subirat-Parent (Malvasia Riojana), Moscatel de Alejandria (Muscat d’Alexandrie), Moscatel de Frontignac (Muscat de Frontignan), Chenin Blanc and Sauvignon Blanc. Additional red varieties grown in this region include the local Samso grape along with the dozens of other local varieties mentioned above. Part of the reason why this DO has taken a major leap onto the international wine scene, was their eventual transition towards using modern winemaking techniques. More specifically, they were the first to use stainless steel equipment and cold fermentation in Spain. Additionally, they altered both the means for which they regulate quantity control and their harvesting techniques. The first trend was required the consejo regulador to set a maximum number of vines which may be planted in any one hectare. What this avoids is the over saturation of vines which both depletes the nutrients in the soil as well as the amount of water available. The second trend was the way in which vines are cultivated. Instead of harvesting all the grapes that are taken from the vines, they now evaluate which vines are successful, taking the weak vines unable to produce enough grapes and turning them into fertilizer. This allows the successful vines to receive additional nutrients from the unsuccessful vines, while at the same time, lowering production levels. Although there will always be exceptions, both red and white wines from the Penedès, as a general rule, should generally be drunk young, and when possible, from the same year they were bottled. Those wines that can be aged should be kept for no more than two to five years. It is suggested that roses should only be drunk young in order to retain their fresh and fruity characteristics. In summary, DO Penedès has had a long and renowned history for their white wines. However, their lighter reds are starting to take a significant role as more international red varieties flourish, aside from Tempranillo (also called, Ull de Llebre in Catalonia, Cencibel in Castile-La Mancha and Madrid, and Tinto Fino and Tinto del Pais in Castile and Leon) creating some extraordinary wines. The best part, being that they are internationally recognized for their wines, you can most likely find a bottle in your local wine shop!